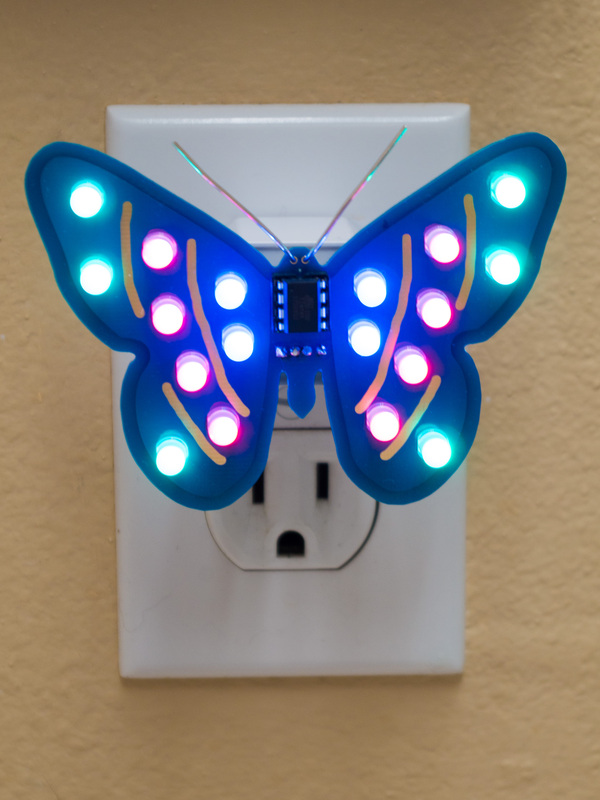 This butterfly-shaped electronic nightlight will add color and motion to your bedroom, bathroom, or really any room in your home! Random colors slowly radiate outward across the 18 LEDs. A control on the back allows you to adjust the brightness, so you can have it bright, dim, or anywhere in between. 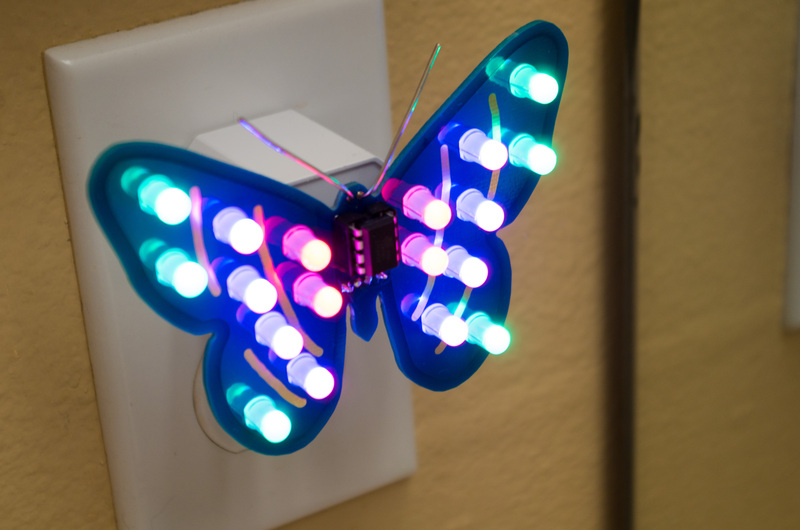 The nightlight plugs into a USB power adapter (a standard phone charger), which then plugs into the wall. For your convenience, the nightlight may be purchased with a North American power adapter, or without a power adapter. If you live outside North America, buy the version without the power adapter, and then supply your own USB power adapter for your country. 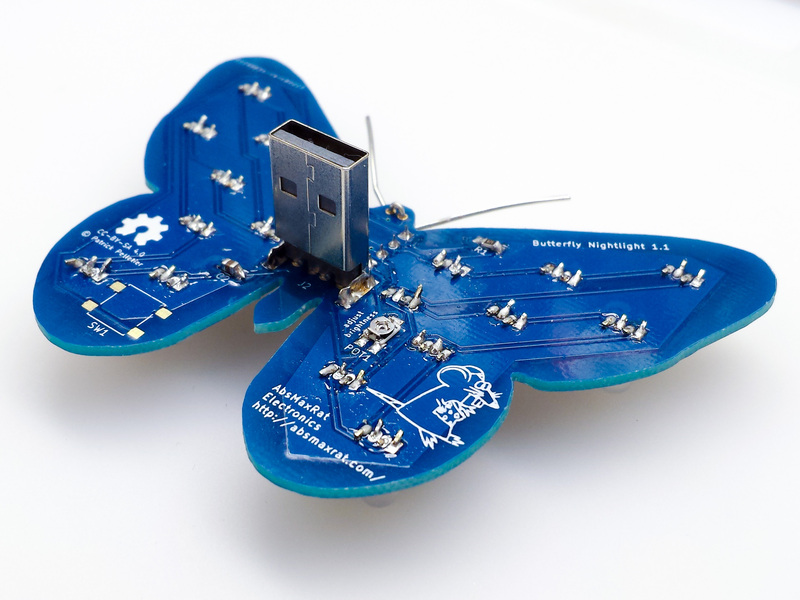 Each nightlight is hand-soldered right here in Ventura, California. I’m currently selling on Etsy, but that might change in the future. So, if you want to find me again, please bookmark the page you are on now instead of my Etsy page. The nightlight weighs 0.7 ounces (20 grams) and the North American power adapter weighs 0.9 ounces (24 grams), so together they weigh 1.6 ounces (44 grams). 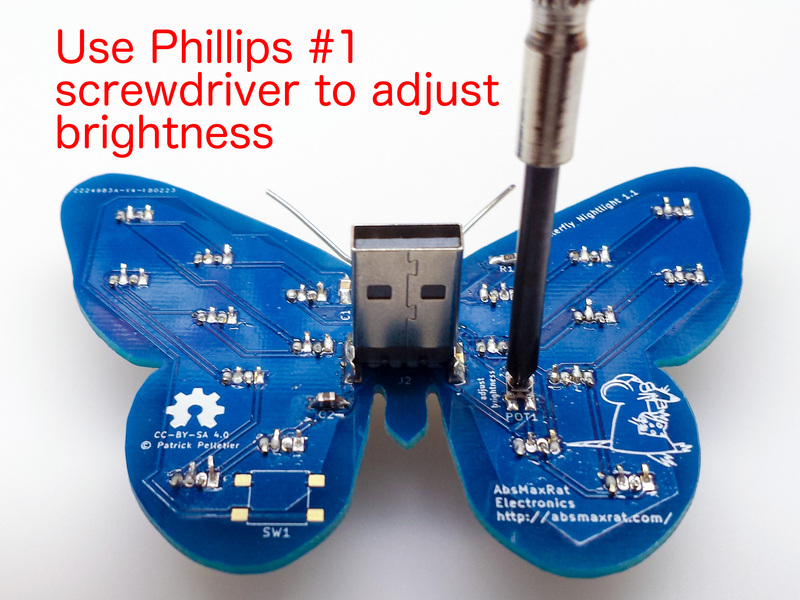 The nightlight runs on 5 volts (the standard USB voltage). At maximum brightness, it draws up to 600 milliamps. At half brightness, it draws about 120 milliamps. At minimum brightness, it draws about 50 milliamps. 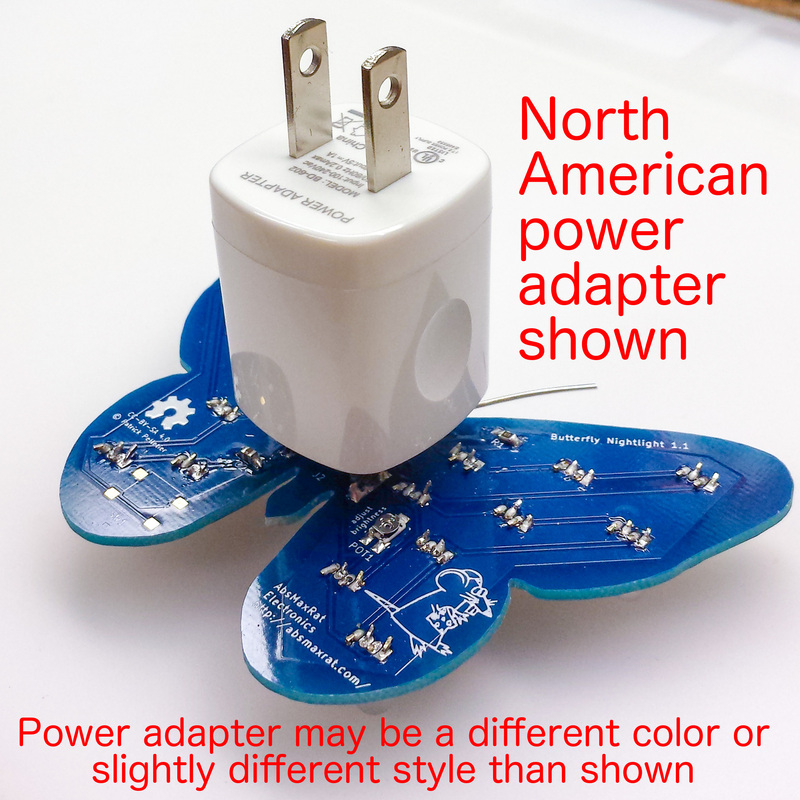 The North American power adapter is capable of supplying 1 Amp (1000 milliamps) at 5 volts. 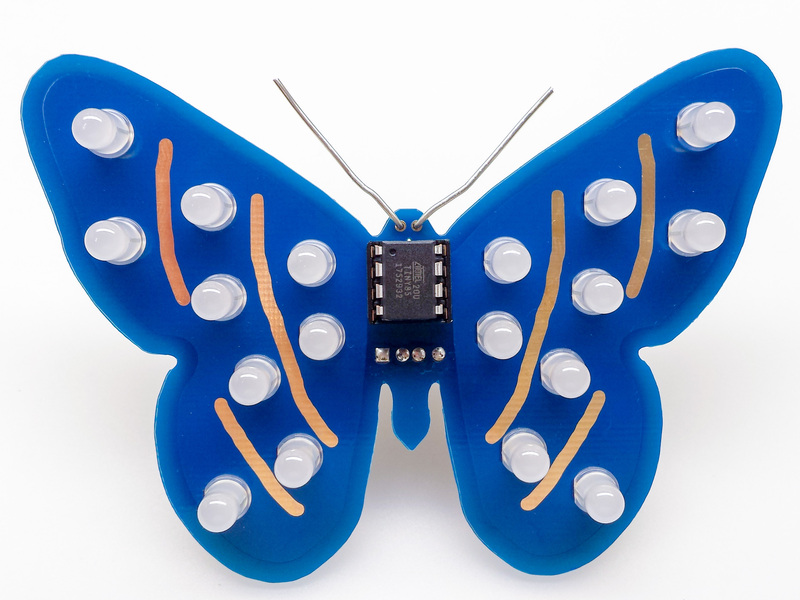 AbsMaxRat Electronics is a very, very small business founded by Patrick Pelletier on Valentine’s Day 2018 in Ventura, California. The name AbsMaxRat is an electronics in-joke: “Absolute Maximum Ratings” is a common section in electronics datasheets. The AbsMaxRat mascot is “Max the Rat.” He comes from public domain clip art by openclipart.org user nicubunu.